If you're looking for a good Korean soft tofu soup recipe, there are many recipes available, but most are not vegetarian and will require adjustments. 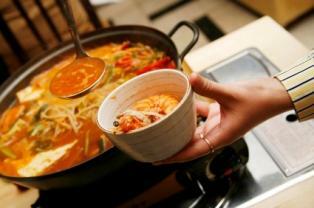 Frequently served at Korean restaurants, this soup may be prepared in many different ways. It pays to check the ingredients carefully. When you are a vegetarian, you may find yourself scrutinizing recipes for hidden animal products. It's very important to analyze a Korean soft tofu soup recipe, too. Certain minor ingredients may be animal based. Additions such as pork or beef are pretty easy to find in these soup recipes, but do be aware that any Korean soup recipe that calls for "bonito flakes" is not vegetarian. Bonito flakes are the smoked and dried flakes of bonito fish and are, therefore, ineligible for your vegetarian version of soft tofu soup. Research any foreign terms in the recipe thoroughly to ensure that these unfamiliar ingredients do not include animal sources. Most ingredients in these soft tofu soups are completely healthy and vegetarian. The focus piece of this soup (which is also often referred to as a stew) is the soft tofu which can be purchased from a Korean market. Soft tofu can also be purchased at health food stores and supermarkets thanks to the ever-increasing popularity of soy foods. However, you may need to purchase a few of the specialty ingredients at a Korean market or from an online source.. Although some vegetarians consume eggs, you can omit the egg yolk. This will change the consistency of the soup. According to tradition, the egg is added only after the boiling soup is poured into earthenware bowls. Essentially, the egg cooks in the heat of the individual soup bowl, adding flavor and altering the consistency of the soup. If you truly want to avoid a trip to a specialty supermarket, the kimchi, which is really just fermented cabbage, can be purchased at larger health food store chains such as Whole Foods Market. You can also, most likely, find a similar chili powder formula at Whole Foods, though you may want to research the specifics of the powder to ensure that most, or all, of the ingredients stated in the Korean version are present. Learning to modify a traditional recipe made with animal products to a vegetarian friendly version takes practice. Let's face it, if the soft tofu soup recipe starts out with a large quantity of live clams and you choose to omit the clams, this significant recipe modification will greatly affect the soup/stew. Eliminating items such as eggs or meat changes both taste and consistency. So, be prepared. Your vegetarian version of this soup will differ largely from its meat based counterpart, though this does not mean your soup will lack in flavor. To make the soup feel fuller, you can substitute the thin-vegetable oil for virgin coconut oil which will impart a hearty flavor into the broth. It is also possible to substitute soy-based "meats" for the beef or pork found in most recipes. Though soy-based meats will not possess the same richness of actual meat, they can help to maintain the stew-like consistency and prevent you from having to adjust proportions of water. Since this soup is actually referred to as a stew, of which the Korean term is "Dubu Chigae", it is far easier to find good recipes when you search for either Dubu Chigae or Korean soft tofu stew. Search for vegetarian options and you are sure to come out with something delicious.